Like everyone else, I love cupcakes. I just prefer to drink mine. If that's not quite enough cupcake madness for you, try some of my CAKE COCKTAILS and just say they're Cupcake Cocktails of the same flavor, I won't tell on you. 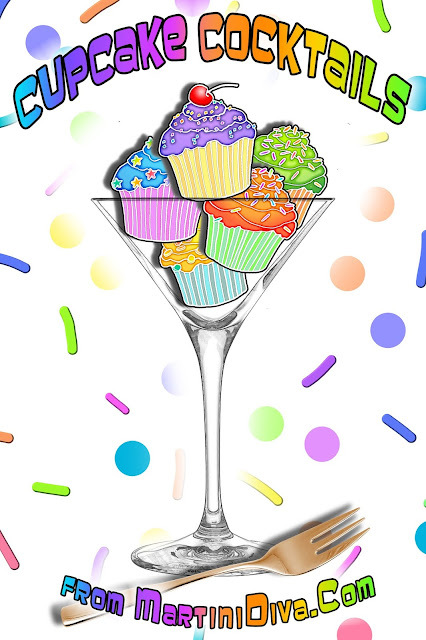 National Cupcake Day is December 15th and National Cupcake Lovers Day is June 13th. Take a cup of blackberries and puree them in a blender. Strain out the seeds and put the puree aside. Melt the butter, brown sugar and honey in the saucepan, then bring to a boil for a minute or two. Add the blackberry puree, balsamic vinegar, wine and salt and bring back to a boil. Cool in the refrigerator until time to serve. When ready to plate pour a little of the sauce into your serving dish. Position one to three strawberry halves on the plate. Top strawberries with a blackberry. Dip your martini glass rim in the chocolate syrup, then into some chocolate shavings. Add a cup of ice to your cocktail shaker then pour in the vanilla vodka, the white chocolate liqueur, the white creme de cacao, the sea salt and the half and half. 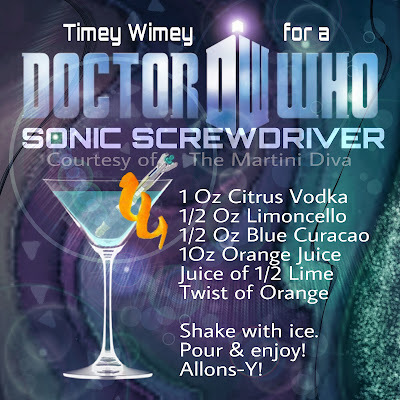 Shake until well chilled then pour into your chilled martini glass. Drop in your favorite chocolate bar and enjoy. 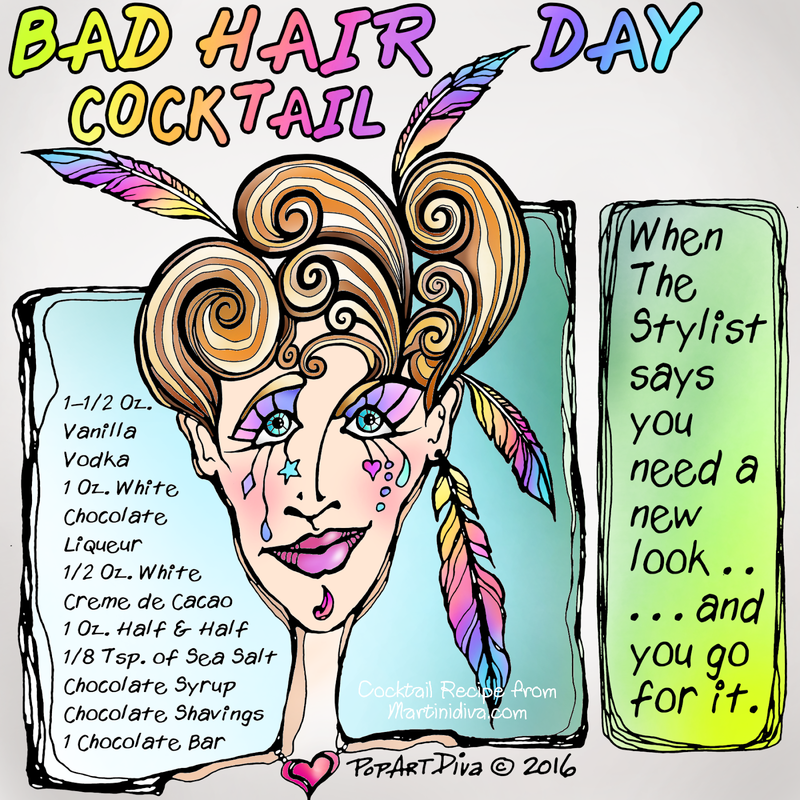 Yes, your hair may still look like a tornado hit your head, but after two of these you probably won't care that much anymore! 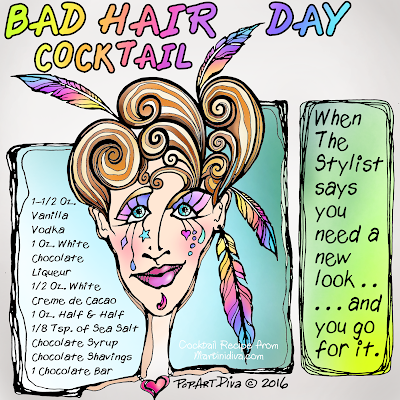 National Bad Hair Day is both March 25th and December 8th (which makes sense because we all know we can have more than one bad hair day a year), National Hair Day is October 1st. 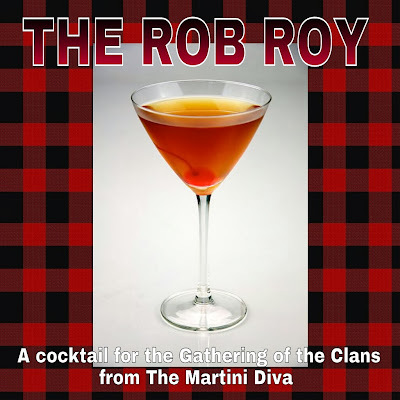 Want to enjoy this martini tonight? I used 2 candy canes per 2 ounces of vodka and was sipping in 4 hours! More Candy Canes = More Flavor Faster. If you crush them up you speed up the process even more! THEN you stick all this boozy chocolate mint goodness in the fridge to chill. Shake it up every 1/2 hour or whenever you open the fridge. After a few hours start tasting a small sip for flavor depth! Crush your 2 candy canes so you have some chunky bits & pour those into a flat plate. 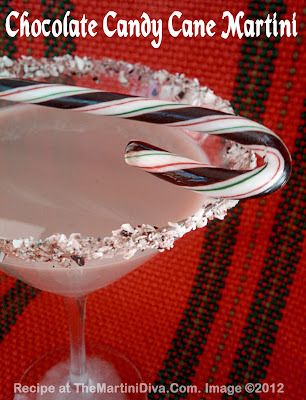 Pour some of your new Chocolate Candy Cane Vodka into another flat plate then dip the rim of your martini glass into the vodka, then into the crushed candy cane. 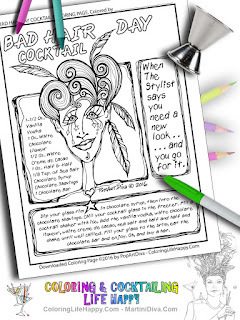 Place your pretty rimmed glass in the freezer to chill. 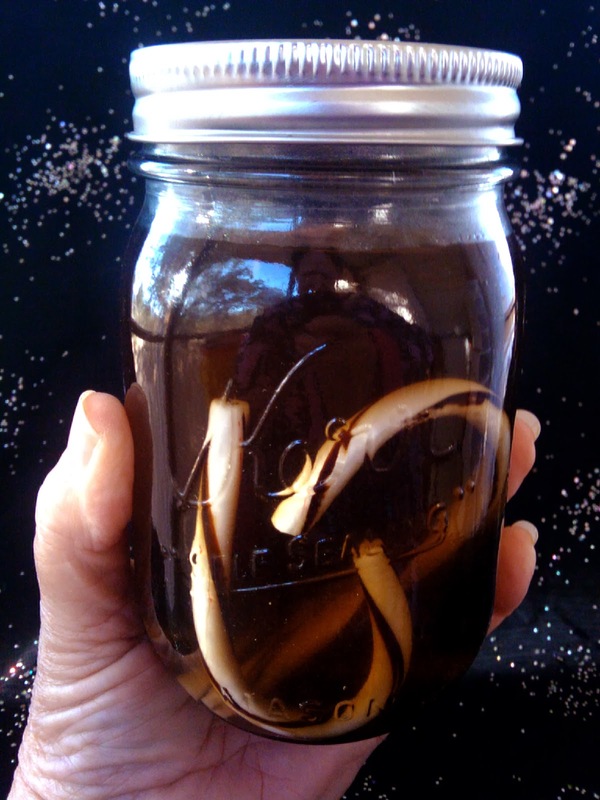 Pour 1 cup of ice into your cocktail shaker then add the Chocolate Candy Cane Vodka, the white creme de cacao, the half & half and the chocolate milk. 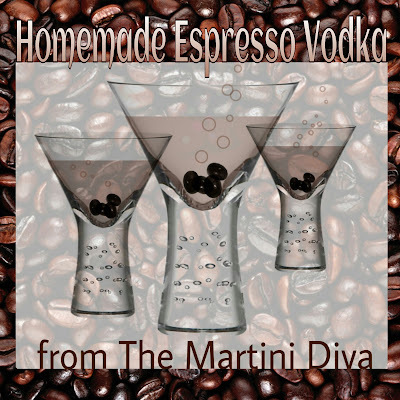 Pour into your chilled, rimmed martini glass. 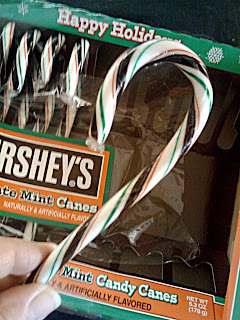 Hang the whole Chocolate Mint Candy Cane off the rim or across the top. BTW, National Candy Cane Day is December 26th! 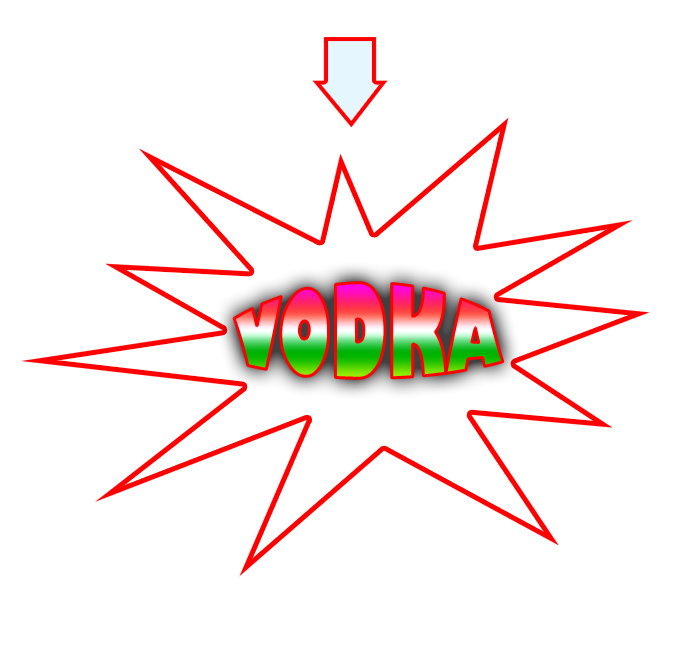 Save some of your vodka! The last two days I have regaled you with bunches of fresh berries boozified into bliss as Fresh Berry Sangria and Berry Sangria Cocktail Gels - all resulting from my foray into Berry Madness a few months ago. 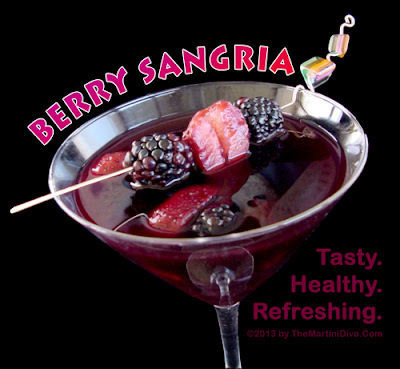 Not only did I made all flavors of berry booze, including Blueberry Liqueur and Vodka and Blackberry Liqueur and Vodka, I had so many berries and so much Berry Sangria that I decided they had to become a dessert as well! I'm berry, berry happy with this recipe. 2 Apple Mint Leaves, chopped. Bring fruit, half the zest and the sugar to a boil in a sauce pan. Reduce heat to medium; cook, stirring occasionally, until reduced by half and the juice is thickened. Scoop out all the berries with a slotted spoon and place in a bowl to chill. Pour the juice through a strainer into a small bowl, this will remove the seeds and most of the pulp. Chill the juice with the fruit until time to serve. Still all the ingredients together until a soft dough forms. Drop by a spoon onto a parchment lined baking dish. Pour the seedless berry sauce into a serving bowl or plate. 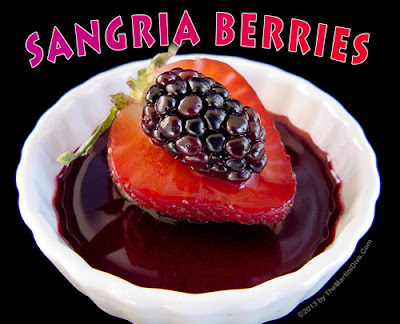 Spoon some of the macerated sangria berries over the bottom half. Place the top of the scone on the berries. Spoon a bit more of the macerated sangria berries on the top. Spoon on some whipped cream. Garnish with a pinch of Clementine zest and/or a mint leaf and scatter a few fresh berries around the plate. Yesterday I told you a tale of Berry Madness wherein I went a little crazy and turned bushels and pecks of berries into Blueberry Booze, Blackberry Booze, (oh heck, I filled the fridge with berry booze flavors! 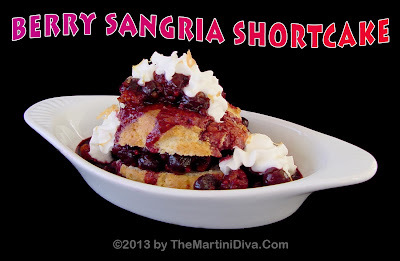 ), Berry Sangria, Berry Sangria Cocktail Gels, Berry Sangria Shortcake and Sangria Berries. Today you get the recipe for Part II of my sojourn into the wild and crazy world of boozified berries, a delicious and delectable cocktail gel (aka jello shot) made from some of that Berry Sangria. Spray your molds and baking pan. Clear space in your fridge for the molds & pans. Mix the water and the gelatin in your pan and stir until dissolved. Bring to a boil then remove from burner. Stir in the Blackberry Jell-O until dissolved. Allow the mixture to cool down for 10 minutes. 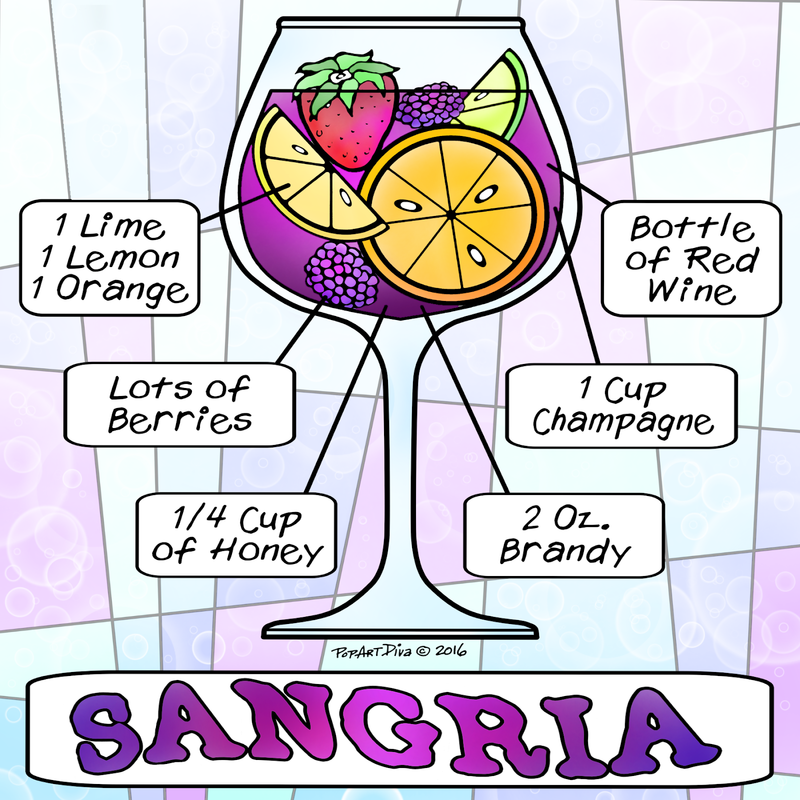 Pour in the Berry Sangria and stir well. Pour into your baking dish (reserving enough to pour into the candy molds for the molded berry gel tops) and place in the refrigerator to set up for several hours. Pour your milk/half & half into your saucepan, add the gelatin and stir well. Let this sit for a few minutes. Place the saucepan on a burner, turn the heat to low and warm the mixture, stirring constantly, until the gelatin is completely dissolved. This takes about 2 to 4 minutes. Do not boil, it's not necessary. Quickly stir in the whipped cream vodka. Pour this onto your berry layer in the 9x13 pan. Carefully set your dish back in the refrigerator until the top can be touched but it's not completely solid, about 3 - 5 minutes. Now you place the molded berry pieces on top, push them down a bit very gently, spaced widely apart enough to allow the cutting of your final gel shapes. 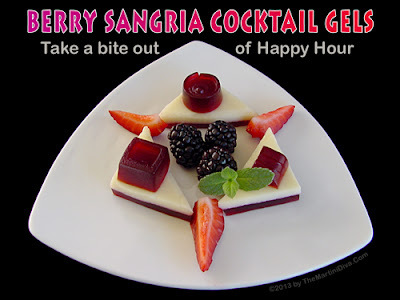 Place two or three of the Berry Sangria Cocktail Gels on an attractive plate, add a few berries and garnish with the mint leaf cluster. If you like you can add a few dollops of whipped cream to the plate! I am always on the lookout for a good deal on fresh fruits. I go to the farmer's market and go a little cray-cray over bushels of citrus, bags of apples, pecks of peaches and big baskets of berries. I buy them all in a mad whirl of fruity insanity and then I get them home and think, "What am I going to do with all of this?" My mother would have made jams or preserves with the extras or just "put up" the fruit for winter consumption, but, sadly, I am not of the canning persuasion. I'm more of the moonshining persuasion. I'd rather throw my bounty of produce into booze instead of canning jars that are destined to gather dust on some cellar shelf. It's a certainty that booze will never gather dust on a shelf in my house. Given this propensity for personal bootlegging, when I fell off the bushel/peck wagon and came home with a half a bushel of fresh blackberries, a part of a peck of fresh blueberries and a whole freaking flat of strawberries, I immediately decided to turn them into booze. I made blackberry vodka and blackberry liqueur, blueberry vodka and blueberry liqueur, strawberry vodka and strawberry liqueur and even a few combos! My refrigerator looked like Popcorn Sutton* had been hiding from the revenuers in there for half a year. And I still had berries left over! So I threw them into more booze, this time red wine, and I made Berry Sangria. 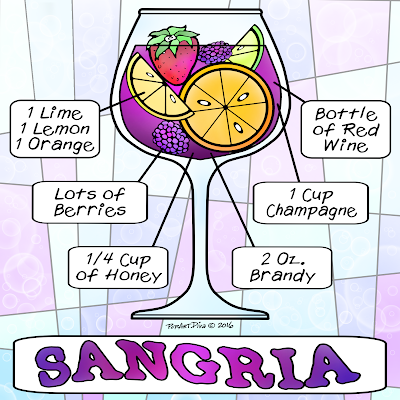 I had done citrus sangrias before but never a berry based wine infusion and I loved it. The berries gave the wine a mellow, fruity sweetness which went down very smoothly! I was also imbibing all those lovely anti-oxidants and nutrition from the berries while enjoying a cocktail. This was a total win/win situation and the best part was I didn't have to use expensive wines. A decent priced (under $10) red wine of nearly any kind works in sangria. 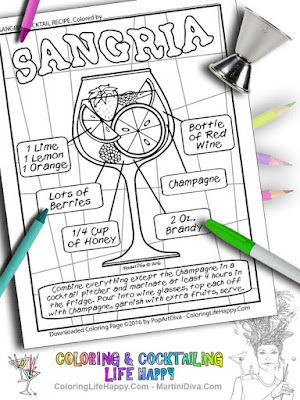 I happened to have some Merlot so that's what I used, but sangria can be made with nearly any type of wine including Cabernet, Zinfandel, Sirah and even white wines. Since I still had fresh fruit staring up at me from their pecks and bushels, I took the idea of boozy berries one step further and created an edible cocktail, BERRY SANGRIA COCKTAIL GELS (Berry Madness Recipe Part II). Yes, I said edible cocktail and, no, I'm not talking your frat-party-Jell-O-in-a-Dixie-cup hooch here (I tossed away my Dixie cups many years ago with my blushing innocence), those berries got gel-ified and mold-ified into little finger popping, high proof, melt in your mouth edible hooch! You would think I put a pretty decent dent in those berries and could freeze the rest. You would be wrong. There was still a few pounds of berries glaring at me from their little bushel and peck beds, a bit more than I had room for in the freezer. By this time I had crossed over from madness into murder and I took those taunting, remaining devils and threw them into the fire. Yup, I reduced their little souls into a Berry Compote to put on top of BERRY SHORTCAKE (Berry Madness Recipe Part III) for a dinner party! I did pardon a few to make some SANGRIA BERRIES (Berry Madness Recipe Part IV) - though I might have been crazed, I was not without compassion. After these berry stressful events I added a straitjacket to my wardrobe, but I am now the Diva of Berries! Just ask my shrink. *Marvin "Popcorn" Sutton (B. October 5, 1946 - D. March 16, 2009) Famous Appalachian moonshiner from Cocke County, Tennessee. Macerate (soak) the berries, Clementine juice, zest and the sugar together with the wine in your pitcher. I used a very moderately priced merlot, but feel free to use a Cabernet, Zinfandel or whatever suits your fancy. Bruise the mint slightly by pinching between your fingers and add to the mixture. Seal the pitcher up with some plastic wrap. Allow to infuse overnight so the flavors of the fruits can fully permeate the wine. If you like a little effervescence, add your (or soda). Garnish with some fresh berries and the mint leaf. 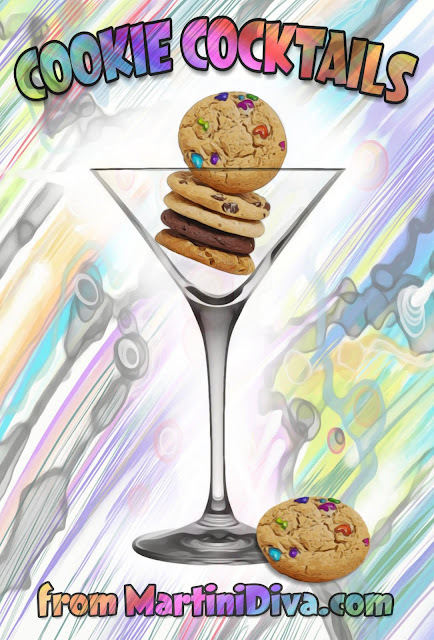 Everyone loves a cookie so what better way to enjoy them then in a cocktail? Just think of the dunking - booze, cookies, win, win! 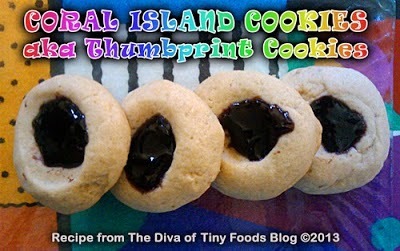 National Cookie Day is December 4th and National Cookie Month is October. 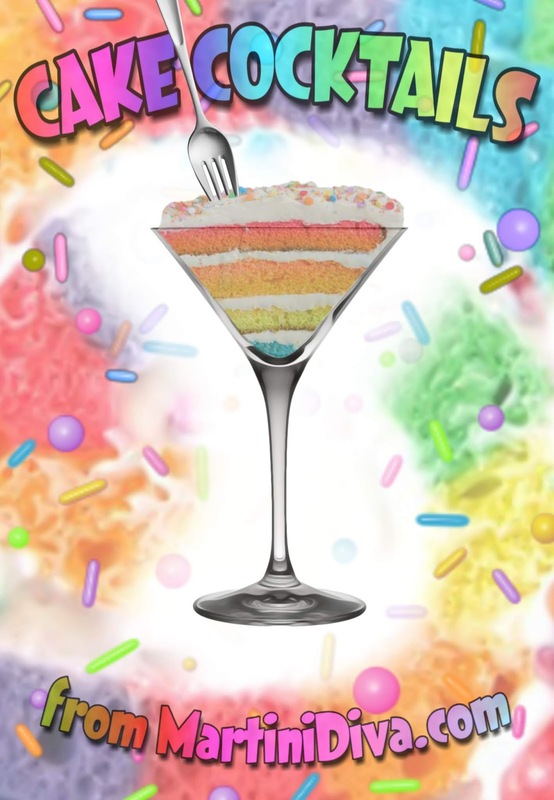 PIE INSPIRED COCKTAILS - Shake, Don't Bake! 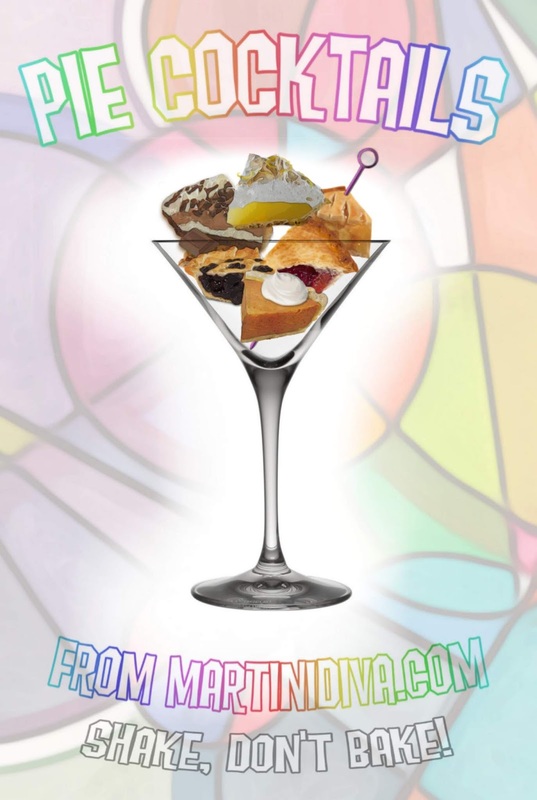 How else would a cocktail lover celebrate National Pie Day than by having one or two pie inspired cocktails? National Pie Day is January 23rd. Every holiday season I am reminded of my very first experience with wine. The holidays, of course, were a big meal deal in my house which called for the "good" tablescape, including Mom's full set of crystal. As one of these glasses was for wine, wine had to be served. Since my mother was not a wine drinker, the wine on our Christmas and Thanksgiving table was always Manischewitz Concord Grape, a very sweet, low proof version of grape juice. It might seem odd that a family would have a Christmas tree and a bottle of kosher wine but it wasn't the kosher my mom was after, it was the sweetness. Because it was the holidays, even the children were allowed a small glass of the Manischewitz. As a kid I loved it, what's not to love? After all, it was booze and it tasted like grape juice. 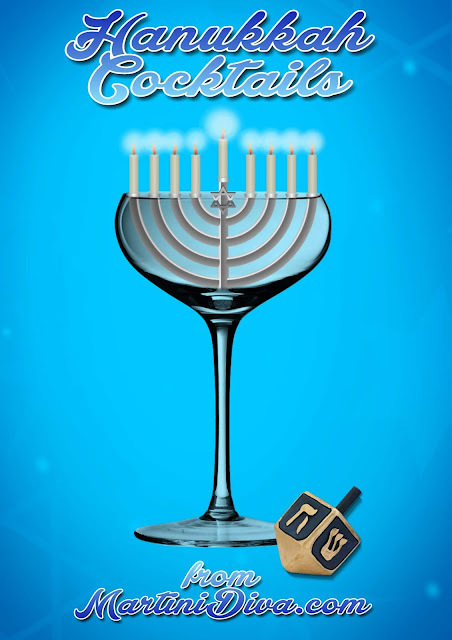 The start of the holiday season made me a little nostalgic and I went out and bought a bottle of Manischewitz. I skipped over the Concord grape and bought the blackberry, a flavor not available when I was a child, at least as far as I know. Yup, still very sweet, but not beyond redemption if I skipped a few years ahead in my booze memoirs and applied the 70's spritzer fad to the recipe. Chill your cocktail glass in the freezer. Muddle the 1/3 cup of fresh blackberries, lemon juice, and honey in the bottom of a cocktail shaker. Add a cup of ice then pour in the blackberry wine and shake until well chilled. Strain into your chilled martini glass, top off with the club soda and garnish with the five fresh blackberries and the lemon twist. Mazel Tov, L'Chaim & Boogie Down! 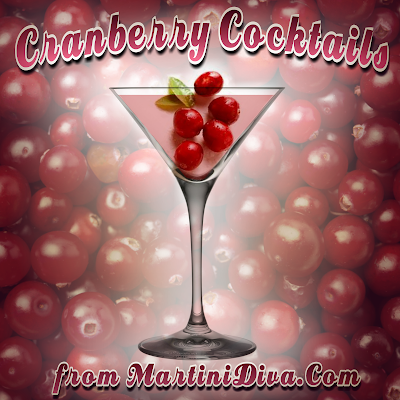 It's the perfect time of year to enjoy cranberries and what better way to enjoy them than in a cocktail. 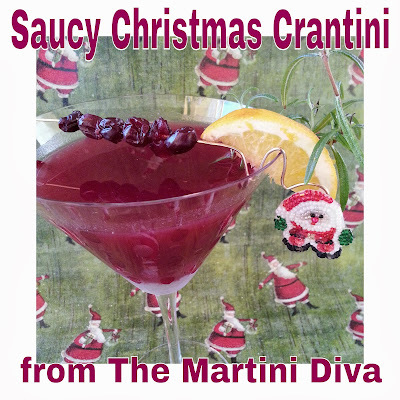 Below you will find my martinis where cranberry is in play in one way or another, whether it be cranberry juice, cranberry vodka or cranberry liqueur. 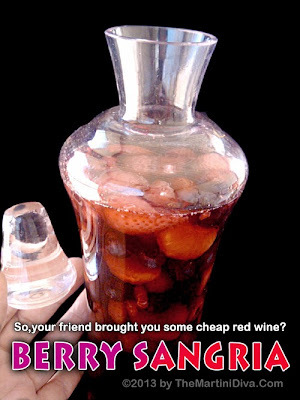 to put in all your Cranberry libations! 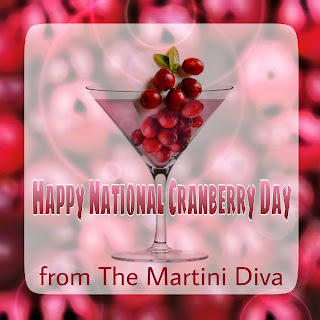 National Cranberry Day is November 23rd. 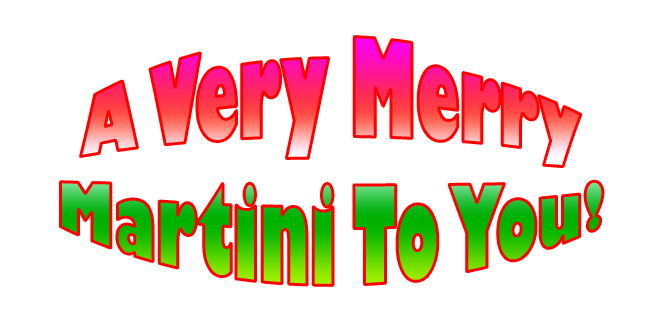 and you know I'm not letting that go by without a special martini! Right? Right! Rub some peanut butter on the rim of your glass, then dip in the chocolate sprinkles. Chill your glass in the freezer. Pour the chocolate vodka, Castries Peanut Rum Crème, liqueur, salt and the whipping cream over a cup of ice in a cocktail shaker and shake until well chilled. 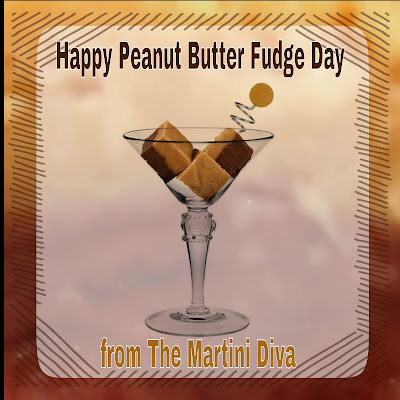 Pour into your martini glass and garnish with a piece of peanut butter fudge.